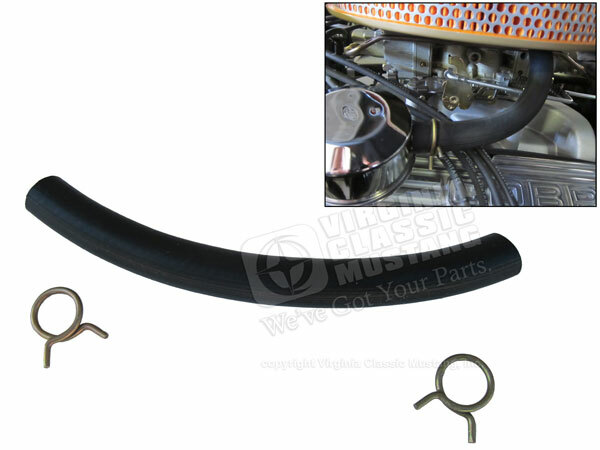 Hose Kit with Clamps for 65-66 GT350 Mustang Shelby. This hose fits from the oil cap to the air cleaner base. A lot of Shelby owners have asked us about the hose that goes from the oil cap to the air cleaner base on a 1965 and 1966 GT350 Mustang Shelby. We finally got around to sourcing this. The hose is ribbed like the original. It has no markings like the originals that we have seen. We measured several originals and came up with a common length of right under nine inches, so that is what is in the kit. The proper “squeeze type” clamps are also included. This hose would have also been originally used on any 289 HiPo Mustang that was originally delivered to a California DSO. This was basically the smog or emissions equipment back in 1965 for the High Performance Mustang. Our part number is EG-3952.